HOPKINTON, MA, February 2, 2015 – The Hopkinton Education Foundation is proud to announce Don Brown, a local family man and entrepreneur, as the winner of the invitational number for the 119th Boston Marathon. Don and his wife Sandy moved to Hopkinton with their 3 children Alexandra, Elizabeth and Austin, 13 years ago because of the school systems’ strong reputation. Having all three children attending or graduated from college, Mr. Brown has decided now is the time to pursue a dream he has had from the very first spring living in town. 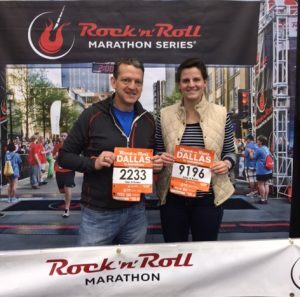 As he and his family watched the marathon that year, he remembers feeling “mesmerized” by the streams of runners and trying to hand his son to his wife Sandy telling her he was going to “jump in as a bandit.” While it didn’t happen that year, Don was challenged by his two daughters to run a half marathon in 2013, and after those two he was hooked! Having run 7 half marathons since, with an 8th already scheduled, the 119th Boston Marathon will be Don’s first full marathon! Don’s local ties are strong, not only due to family, but also when he made the choice to open Arteriocyte Medical Systems in 2007, he knew South Street in Hopkinton was the right choice. To date, he has helped build Arteriocyte to nearly 100 employees worldwide. But, he remains loyal to Hopkinton, hiring 15 high school junior and senior interns interested in biology, and has hired a number of them permanently after college graduation. HEF is proud to have a man with such strong ties to both Hopkinton education and the town itself representing the organization on the run from Hopkinton to Boylston Street! Please visit https://hopkintoneducationfoundation.org to learn more about Don and to make a donation to his fundraising campaign. The Hopkinton Education Foundation provides funding, ideas and professional development to help Hopkinton educators deliver innovative educational experiences that inspire students to strive for excellence and become lifelong learners. Since its inception in 1992, the Foundation has made more than 300 grants valued at over $1 million. Recent grants include a $37,440 STEM (Science, Technology, Engineering and Mathematics) grant at the Middle School and a $26,500 grant for a state-of-the-art language lab at the High School. For further information, visit www.hopkintoneducationfoundation.org, or the Foundation’s Facebook page.